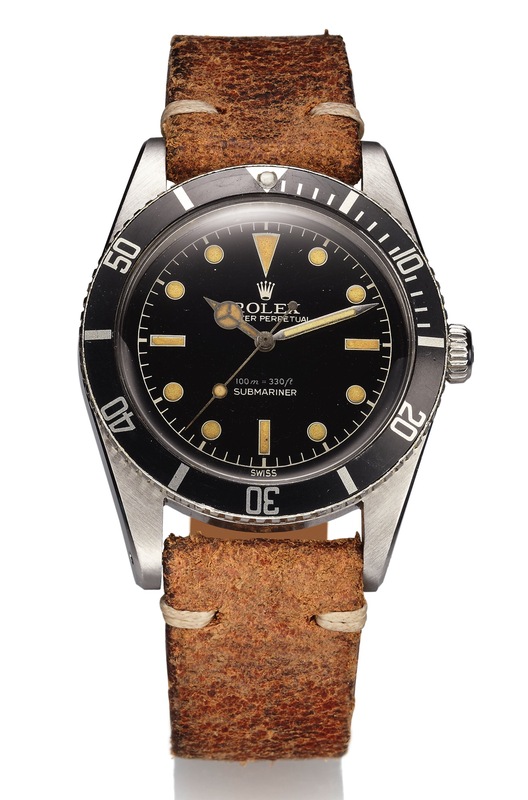 ROLEX REF 6536 SUBMARINER GILT GLOSSY DIAL STEEL Rolex, "Oyster Perpetual, Submariner, 100 m / 330 ft" case No. 399749, Ref. 6536. Made in 1959. Very fine and rare, center seconds, self-winding, water-resistant, stainless steel diver's wristwatch . Three-body, polished and brushed, curved lugs, graduated revolving black bezel for the decompression times, screwed-down case back and crown. Black with luminous baton, triangular and round indexes, outer minute track. Luminous steel skeleton hands. Cal. 1030, rhodium-plated, 25 jewels, straight-line lever escapement, monometallic balance adjusted to temperatures and 5 positions, shock absorber, self-compensating Breguet balance spring. C. Three-body, polished and brushed, curved lugs, graduated revolving black bezel for the decompression times, screwed-down case back and crown. D. Black with luminous baton, triangular and round indexes, outer minute track. Luminous steel skeleton hands. M. Cal. 1030, rhodium-plated, 25 jewels, straight-line lever escapement, monometallic balance adjusted to temperatures and 5 positions, shock absorber, self-compensating Breguet balance spring. Dial, case and movement signed. DIAM. 37 mm. THICKNESS 14 mm. This example of ROLEX REF. 6536, with gilt glossy dial, clear silver print DEPTH rating and sharp, well-defined case represents one of the most classic and well-preserved of the reference.